Venue: Stadio Olimpico, Rome Date: Saturday, 7 February Kick-off: 14:30 GMT Coverage: Live on BBC TV, HD, Red Button, Radio 5 live, Radio Ulster FM, the BBC Sport website, mobile, the BBC Sport app and Connected TV. 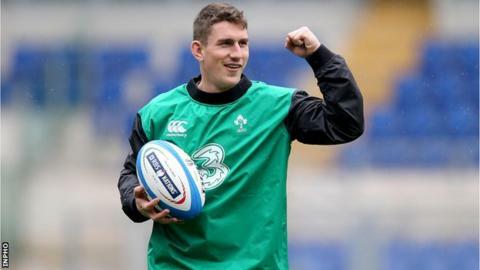 Sergio Parisse has admitted that Ian Keatley's selection as Ireland's fly-half for Saturday's Six Nations game in Rome came as a surprise to Italy. The Italians were banking on Ian Madigan starting in the Ireland number 10 jersey and Parisse says that Keatley will face a pressurised environment. "We thought in our minds it would be Madigan," said the Stade Francais star. "For him (Keatley), it's a great opportunity (but) he will have great pressure on his shoulders." Parisse, 31 claimed Italy will not single out the three-cap Ireland fly-half to try to prey on his inexperience but was happy to talk up the pressure that the Munster player will face in the Stadio Olimpico. "We must keep pressure on him, but not just only on him," added the 108-times capped number eight. "Obviously with any team you want to put the number 10 under pressure. "When you have an opportunity to play for your country in a match in the Six Nations, there is a big responsibility, big pressure. "So it's for him to manage this pressure." Italy did defeat Ireland in Rome two years ago but the injury-ravaged Irish were woefully under-strength that day in what proved to be Declan Kidney's final match in charge. Under new coach Joe Schmidt, Ireland regrouped in impressive fashion last year to clinch the Six Nations title but Parisse believes the home team are capable of causing a major upset on Saturday. "I really feel that if Ireland play at 60 or 70% against us they are not going to win tomorrow. They must play at 100% to beat us," said Parisse. "So it's going to be tough for Ireland. "I'm really confident in our team and our plan and that we'll put everything into getting the win." Parisse also insists that there is genuine quality in the Italian squad in addition to their undoubted passion. "This is the big chance for us. "And as I said before we'll play against a really quality team tomorrow and I'm really confident my team is ready to play a great match this weekend."